I am using the product around pool area, do I need some type of sand mixed in so will not be slippery when wet? This is a penetrating sealer. It is not possible to add a grip to it nor is there any need. does superseal m require etching of the cement? I get water in my house when it rains hard and the wind is blowing. Will this product help? That would depend on where the water is coming from into the ouse and what your house is actually made of. If concrete it would help prevent from going through the concrete, but if coming through large cracks, a sealer will not work to stop the water. Does this sealer work on grout in a shower floor? No, it will not react properly. Is this useful for joint stabilization also? I have a mixture of clay and concrete pavers with paver sand in the joints. No. This will not do anything for the joint sand. How does it clean up in a garden sprayer - water? I am sealing a 1 yr old patio and 25+ yr old steps - is one coat enough? I want an interior slab sealed with a satin finish. No stain, new slab (poured a month ago) for kitchen livingroom. Also a broom finished covered porch. Is superseal-m the product I'm looking for? Sorry, but there is not a satin shine in the Super Seal-M. None of our products will have a "satin" shine for interior surfaces. I live in upstate (Albany) NY. Would like to seal my concrete garage floor (never sealed) against road salt & water. Would SuperSeal M be a good product for this? If so, can it be rolled on and how much would I need for a 12'x30" garage floor? Thanks! Use the Super Seal-M and spray it on. Covers 200 sq feet per gallon so 2 gallons will work for you. Can SuperSeal M be used on Travertine paver? No it will not. None of our products will work for a shower. will this work on plaster finish shower walls? tile and grouted shower floor? does it leave a sheen? 1. Can I seal with your water-based sealant in the next few days? Yes as long as surface is dry. I have about 1500 sq. ft. of concrete brick pavers. I just power washed them 2 days ago. 1. Can I seal with your water-based sealant in the next few days? 2. Will I need more than one coat? 3. How much sealant will I need? This should work for you and does not change the appearance. Never heard of Ardex top dressing though. Can you use super seal m on pavers with polymeric sand? Zoel, we do not ship to Canada from this website. Most use the SuperSeal30 for exposed aggregate. SuperSeal M is a penetrating sealer that does not change the appearance and is typically used on plain concrete. Stamped Concrete is decorative and usually needs a sealer that films on the surface to give a wet look and some sort of gloss. Is Super Seal-M5 good for stamped concrete or is the stamped concrete not porous enough? About 4-5 years is normal. 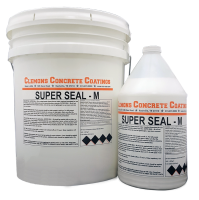 how long does super seal-m5 protect a concrete driveway?